Give us a call to get a free estimate for a roofing installation at your home or business in Angus. With the increase in home flipping and renovation shows and blogs, many property owners are taking on more of their own property maintenance tasks. While some tasks are more doable, others should always be left to the professionals. Roofing installation and repair certainly fall under the latter category. A simple mistake in the process of roofing installation could leave your building exposed to the elements outside and any pests that might want to make their way inside. Even climbing up on the roof can be dangerous, especially if you don’t have proper safety equipment. A wrong step could cause more damage to your roof, which will be expensive to fix. 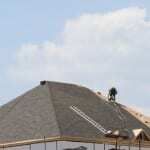 Instead of trying to take on the job yourself, give us a call at Slippery Slope Roofing. We offer roofing installation, repair, maintenance, and other services to keep your roof in great condition for years to come. Our owner and foreman have 50 years of combined experience in the roofing industry, and we stand behind every job we do. On new roofing installation jobs, we offer a 10-year warranty on our workmanship in addition to the warranty on the shingles. Give us a call to get a free estimate for a roofing installation at your home or business in Angus, Ontario. We use high-quality fibreglass shingles that can withstand the changes in climate that we experience every year. Our company is accredited by the local Better Business Bureau. Every aspect of the work we do is handled properly and safely to ensure that your roof installation is up to the industry standards.